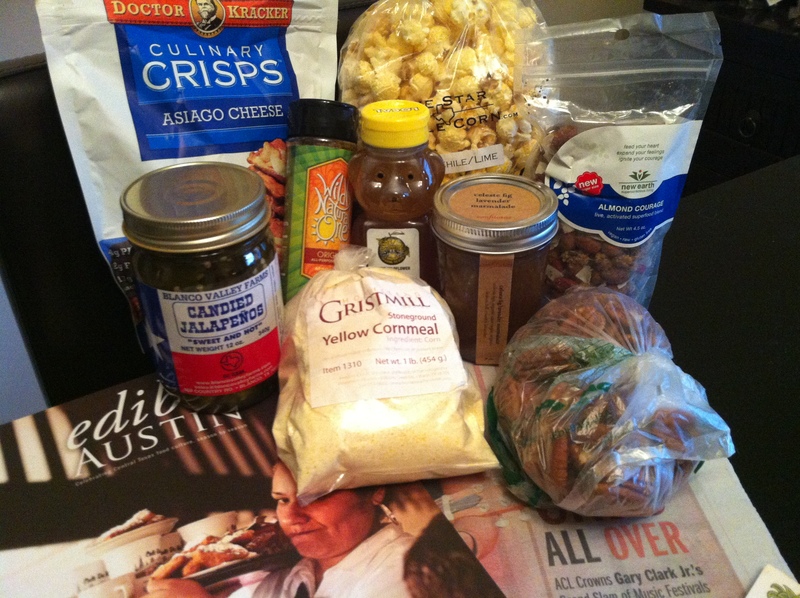 This year, for the first time, I was lucky enough to participate in the Austin-Boston Food Blogger Swap (#atxbos), which matches food bloggers from Austin, TX and Boston, MA to swap foodie care packages in the month of October. The only rules? 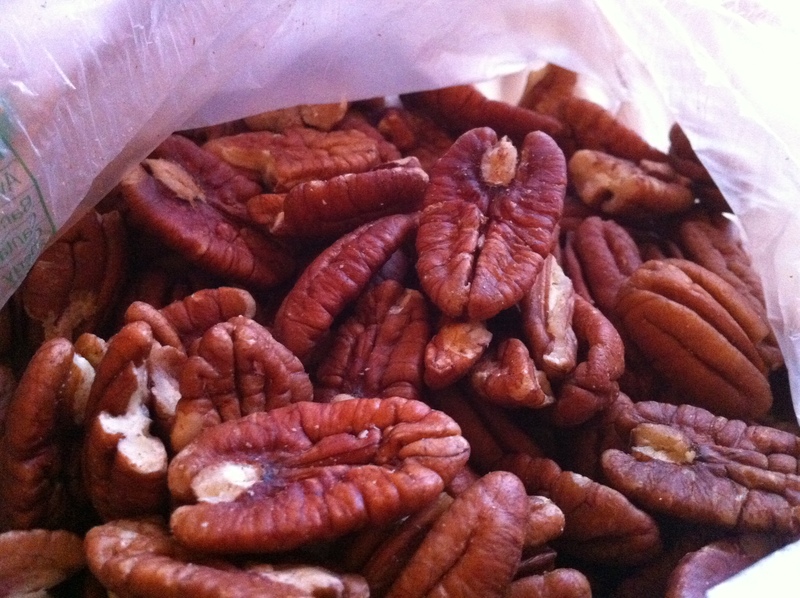 A $30 limit and a passion for local food products! Blanco Valley Farms Candied Jalapenos (life-changing. Seriously). 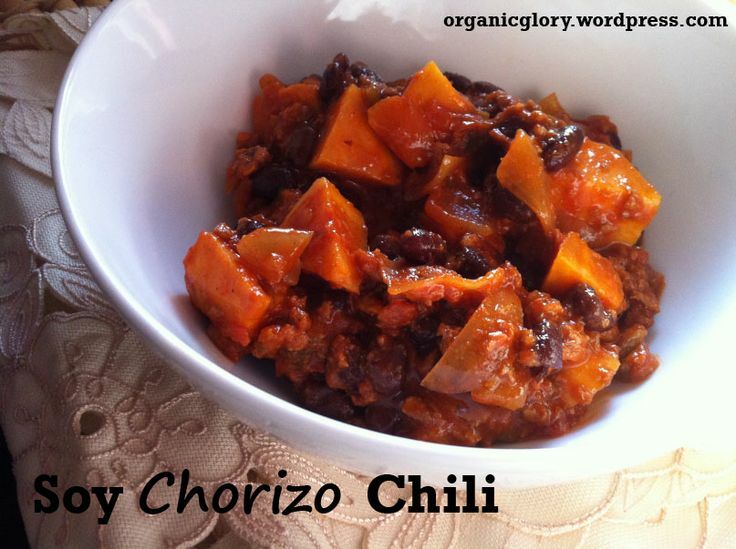 Make sure you check out Christy’s blog, Epicuriosities, and follow her on Twitter @Christy111luv. 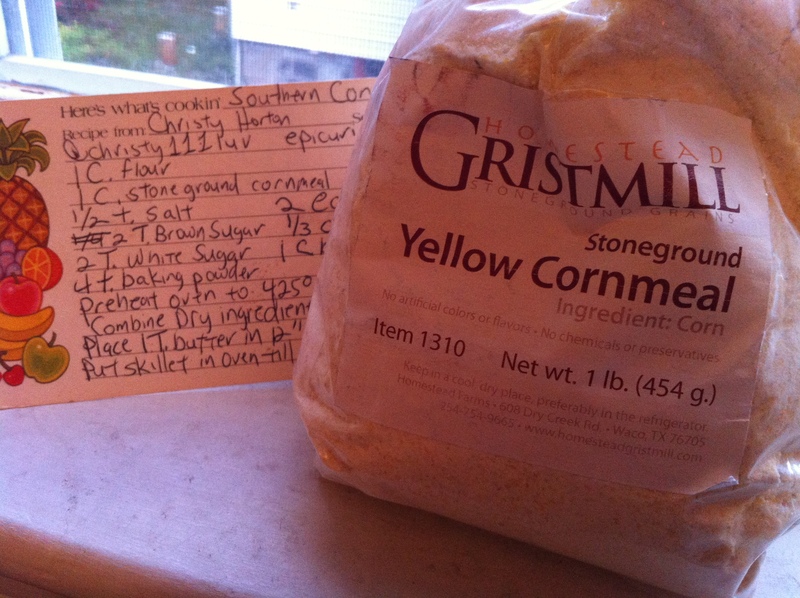 She sent me her own recipe for Southern Corn Bread, which I’ll definitely be making (and blogging!) soon. I may even take her tip to throw in the candied Jalapenos to keep it Texas style. 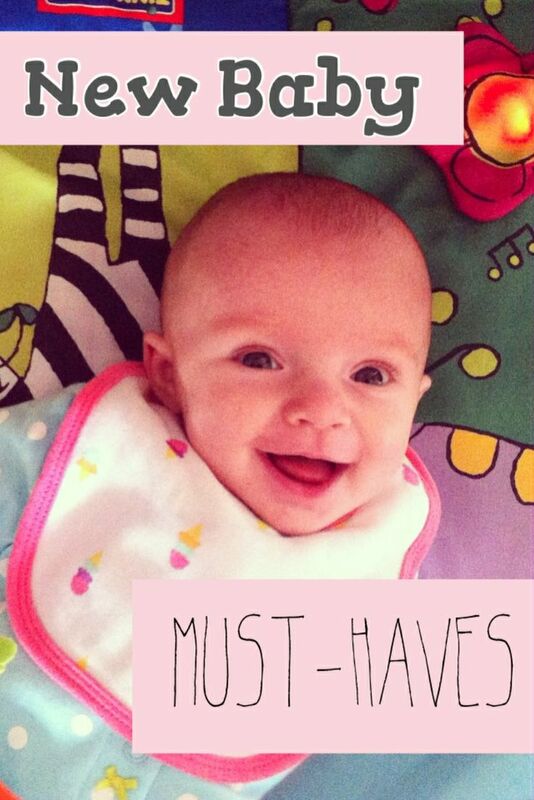 I hope she enjoys her Boston food package as much as I liked getting her sweet n’ hot Texas goodies! 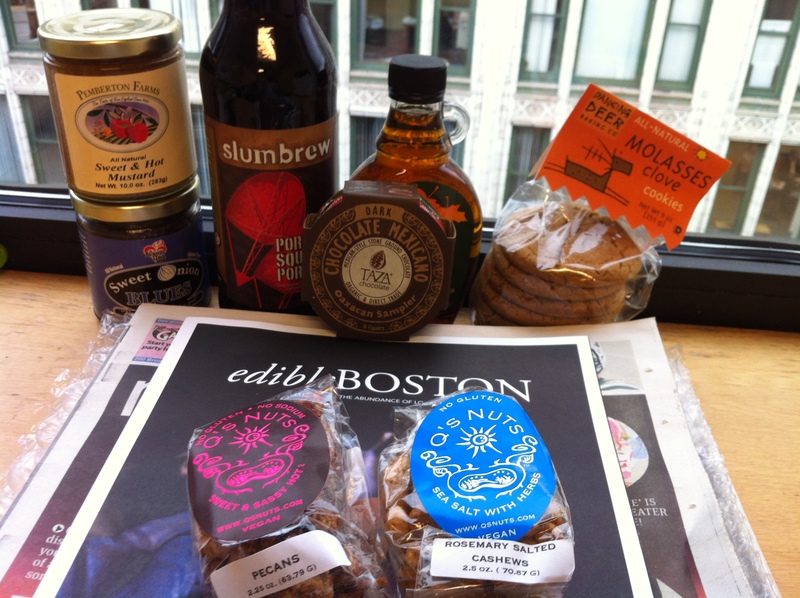 And here’s what I sent to Texas: Bostonians will recognize Taza Chocolate, Slumbrew’s Porter Square Porter, Pemberton Farms mustard & more. 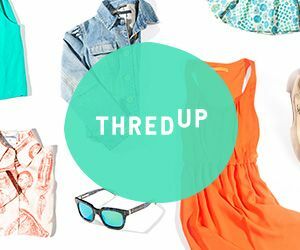 Did I miss any awesome local products? If you have ideas, leave them in the comments! 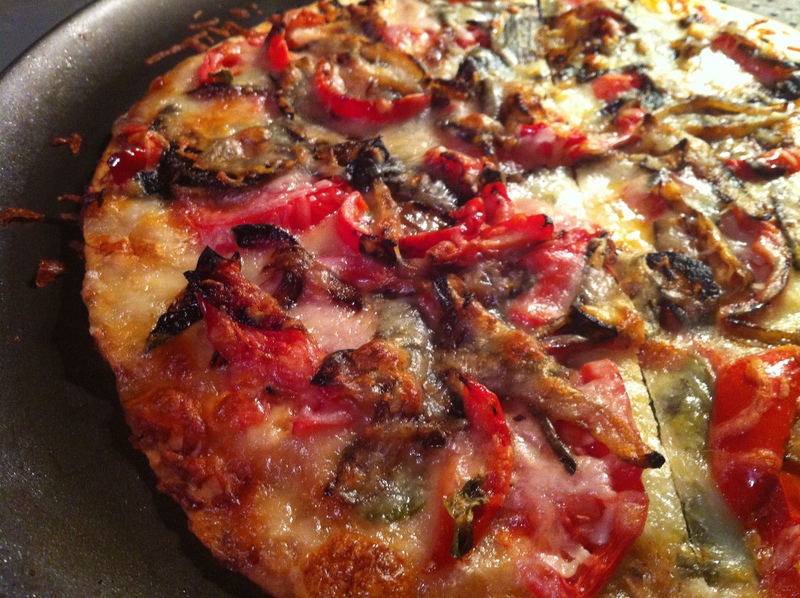 This is my favorite pizza recipe to date. I made it last weekend to have on hand for a crazy week coming up, and Mark ate 90% of it in one sitting (so much for me taking it for lunch!) 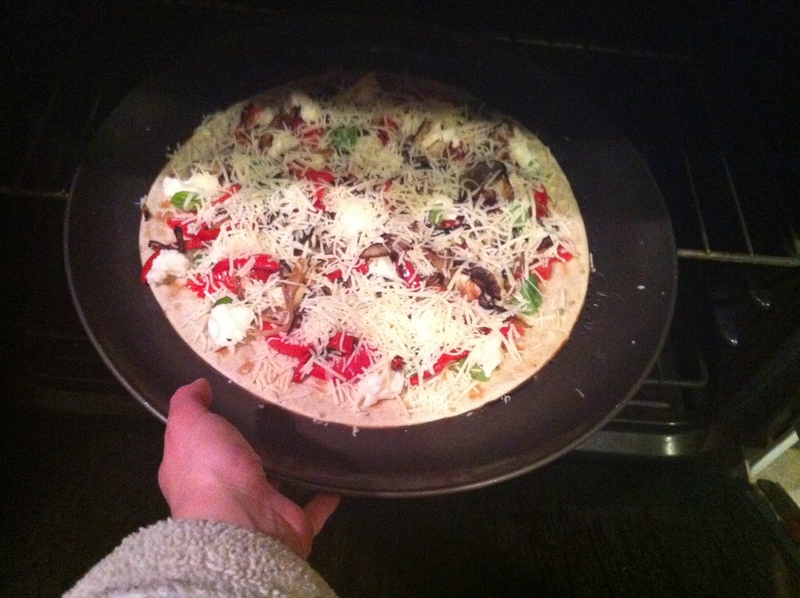 Luckily, the pizza dough came in a two-pack, so I just whipped up another one. 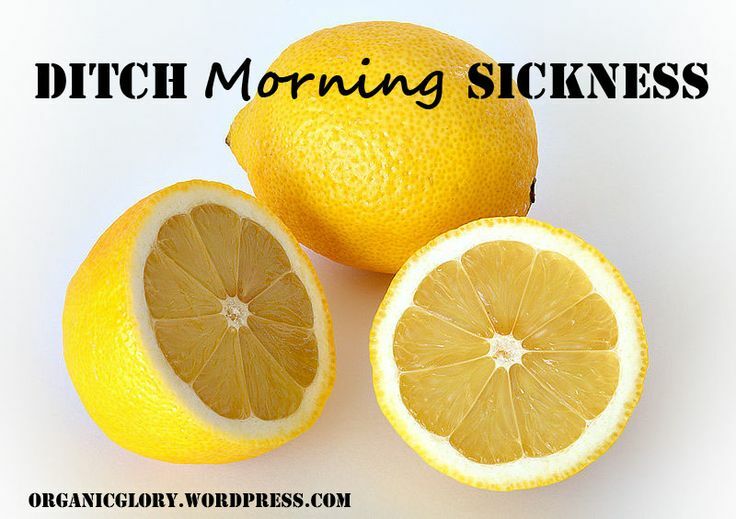 It’s less than 20 minutes from chopping block to table, making it fast AND healthy. Serve with a spinach salad and you’re set! Serves 2. One pizza = 6 slices. Hands-on time: 10 minutes. 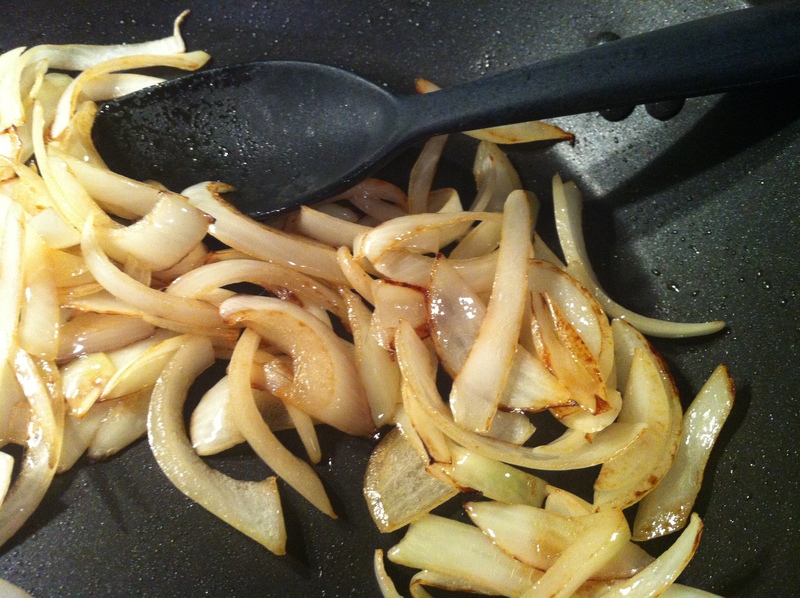 Cooking time: 10 minutes. 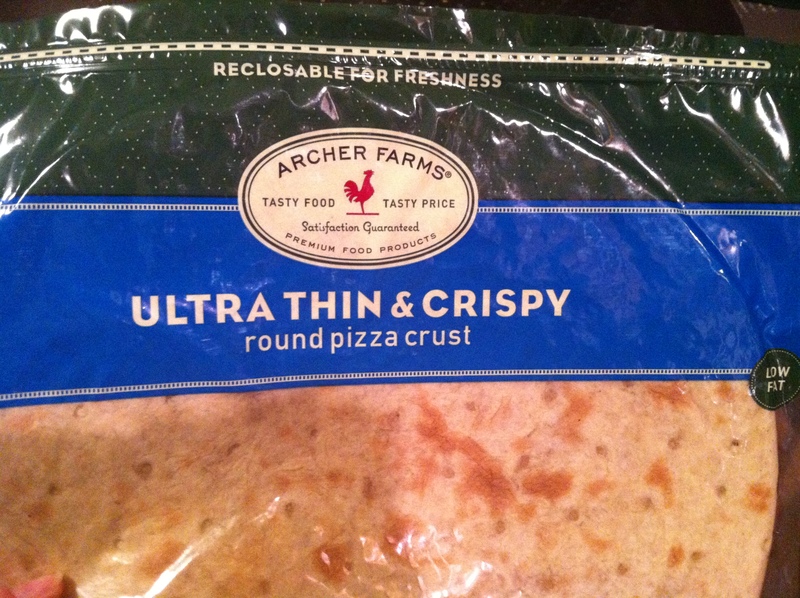 I really liked the Archer Farms brand from Target, because it’s a thin-crust pizza that is low in fat and cooks up quickly. Also, it comes with two pies in a pre-made package. 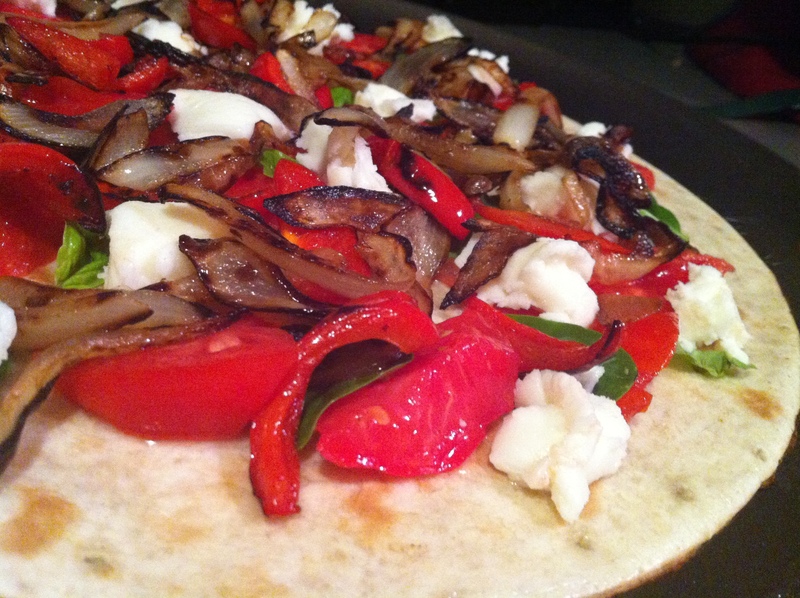 My recipe easily doubles if you buy twice the tomatoes, red peppers and onions (or use from your garden), and if you use the entire block of fresh mozzarella and the entire 2-cup bag of pre-shredded cheese. 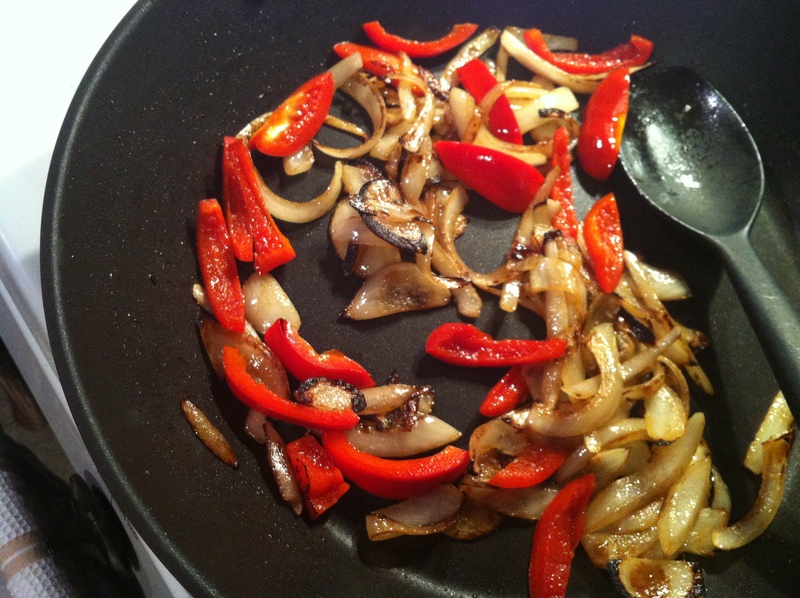 …and the red peppers to blacken on the edges for tons of flavor. Add as many tomatoes as you like. These were some late, sweet beefsteaks from my garden, sliced into smaller pieces. 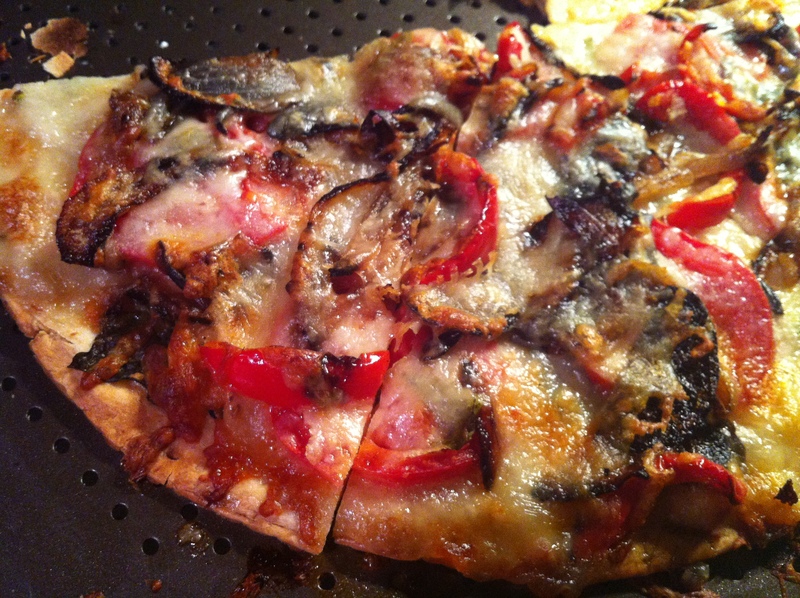 I like to keep them away from the outer edge so the crust cooks up nice and crisp in the oven. 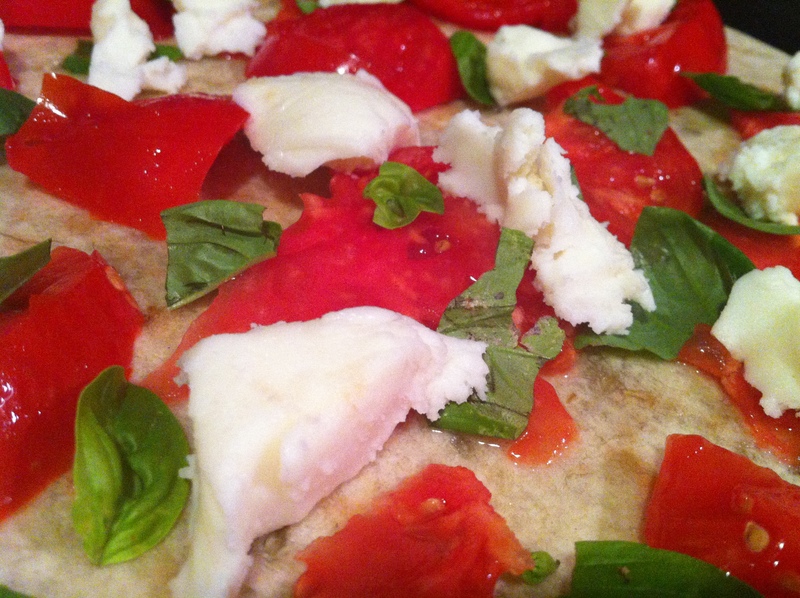 …and then the mozzarella in fresh pieces, which helps hold the basil down. 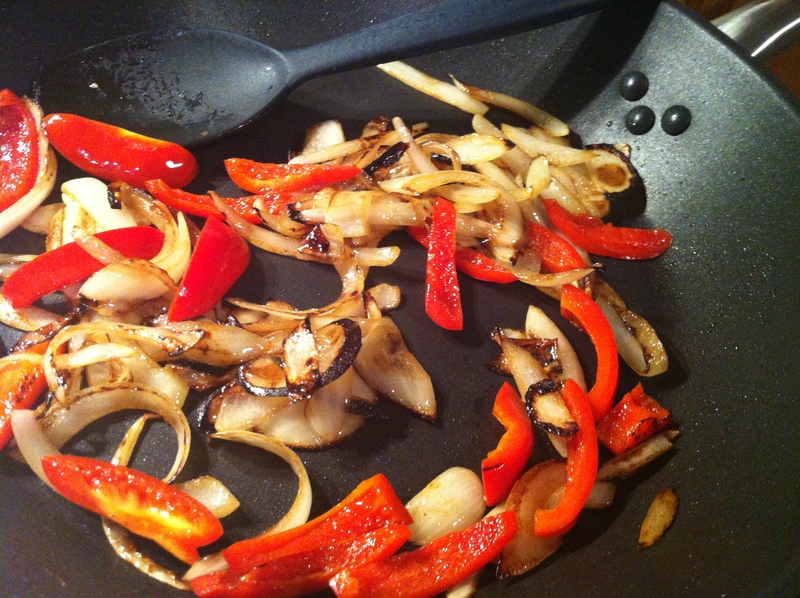 Add your onions and peppers on top. 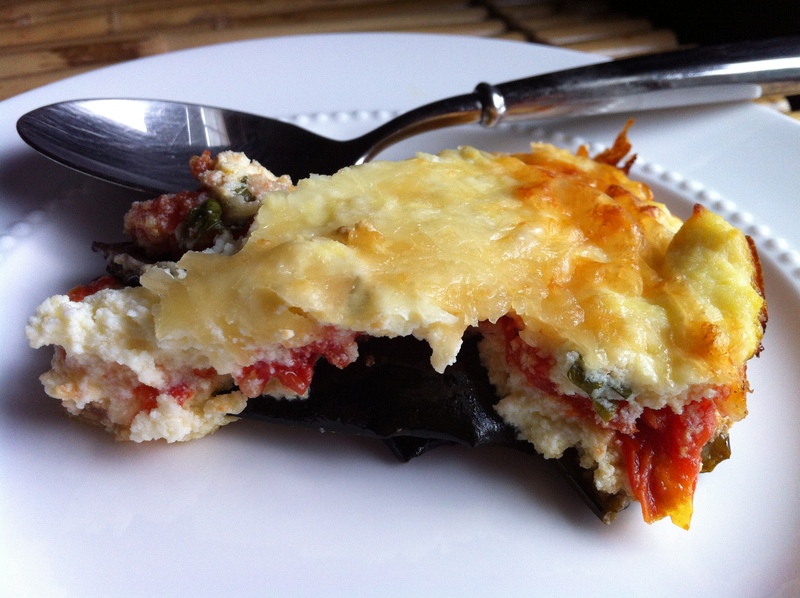 Sandwiching the basil between layers like this keeps it from burning and bakes the flavor into the whole pie. 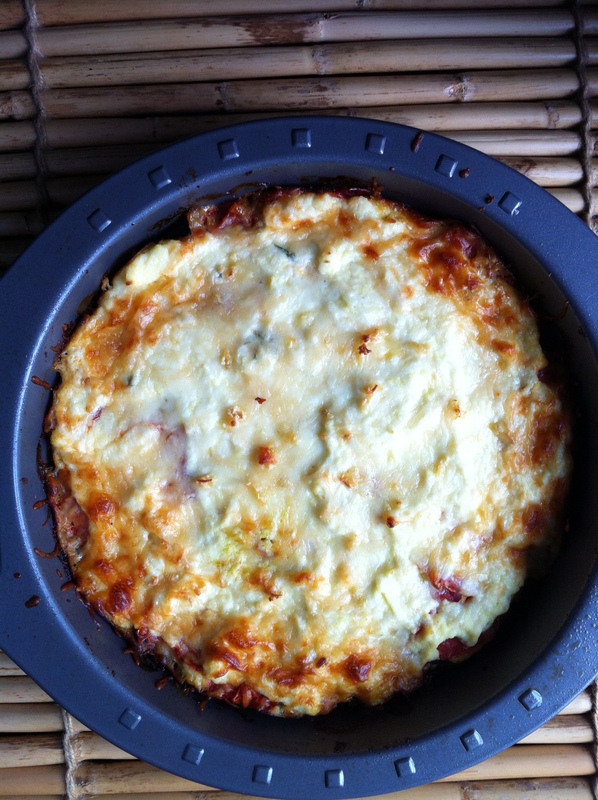 Preheat the oven to 400 and top the pie with the shredded mozzarella and parmesan. I used a bagged variety becuase the two cheeses came together in a two-cup package, and I used a little less than half for one pizza and the other half on a much cheesier second pizza a couple days later (after my husband, ahem, polished off the first version like it was a personal pan pizza). Yup, that’s my comfy bath robe. It helps me cook. YUUMMMM. When it comes out, it just needs to cool for a couple minutes. A tip I learned in Italy? 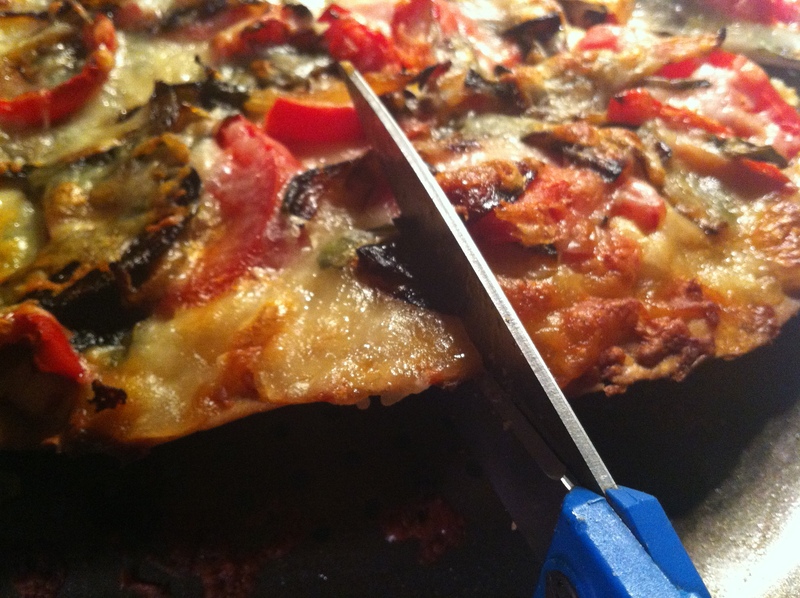 Just use scissors to cut pizza. Easy as pie (ha, ha). Ricotta is one of my favorite things, edible or otherwise. Light, fluffy and creamy, it never lets me down. 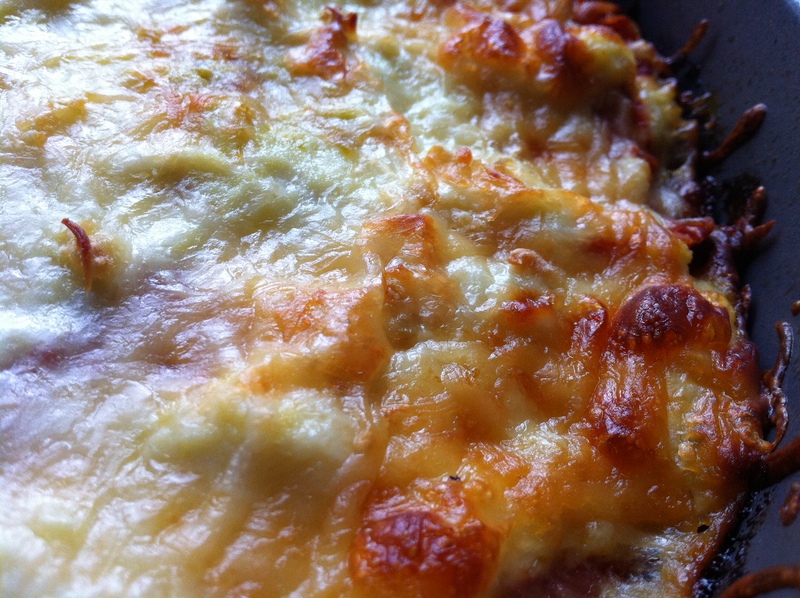 Am I a walking stereotype with all the garlic, pasta and cheese on this blog? Probably. Do I care? Not in the slightest. (It’s not my fault Italian food fits naturally into the vegetarian diet). This serves as an excellent side dish, or a standalone brunch/breakfast option. 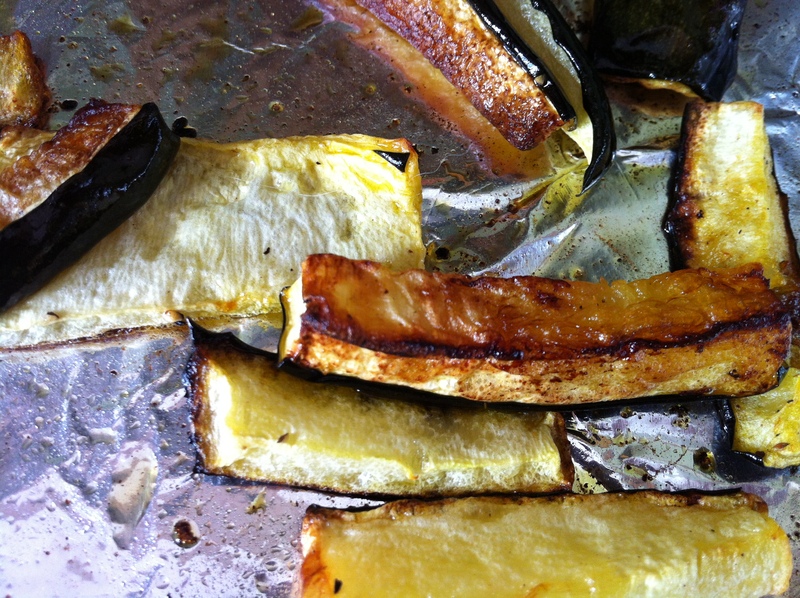 You can roast the vegetables ahead of time and then assemble & cook later on, or the next day, to save time. 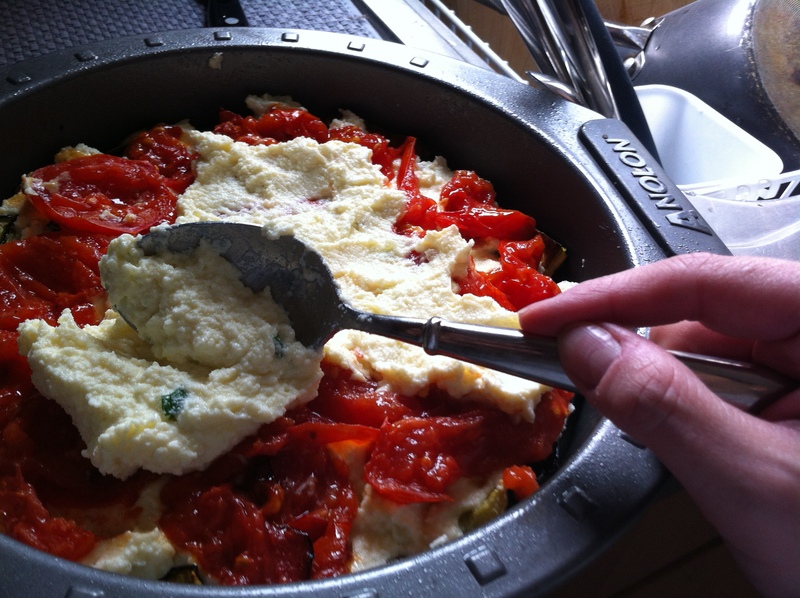 If you keep a home garden and are abounding in tomatoes and zucchini in later summer/early fall, then this comes together in a snap with only a few more ingredients: ricotta, 1 egg and fresh-grated parmesan cheese. This is becoming a theme: Tasha photo bombs me just as I’m about to finally get the shot I need. This one’s actually a double-whammy if you count the whiskers coming in from the top left AND the reflection of her snout in the spoon. Appetizing? 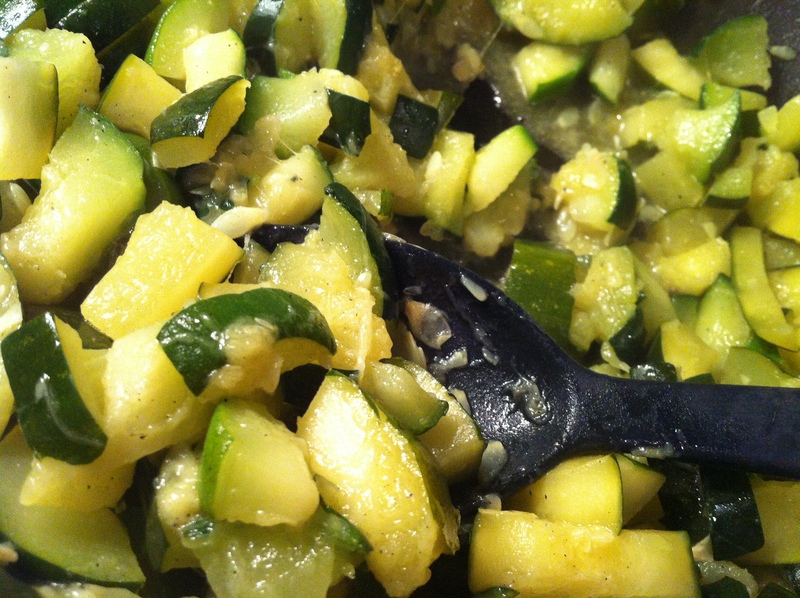 To start, slice the zucchini into quarter-inch thick strips, discarding the ends. 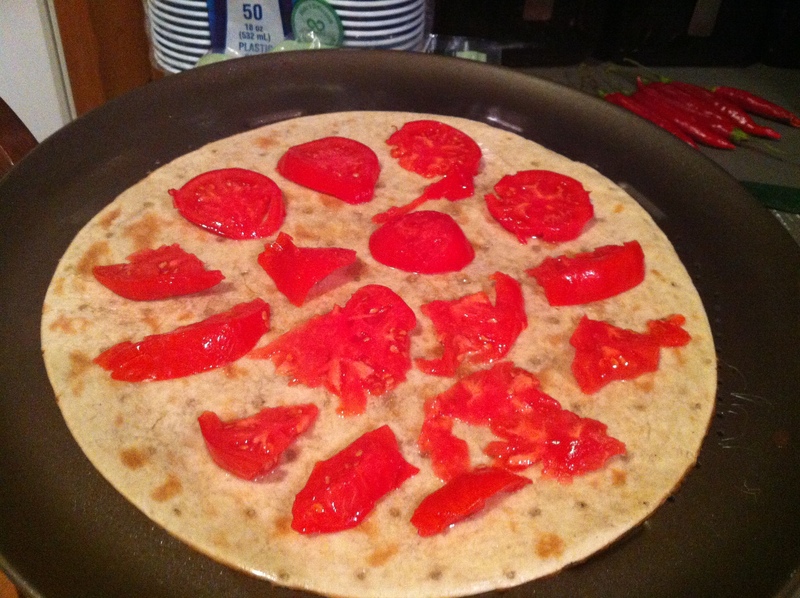 Slice the tomatoes into medum-thickness rounds, discarding the stems and ends. 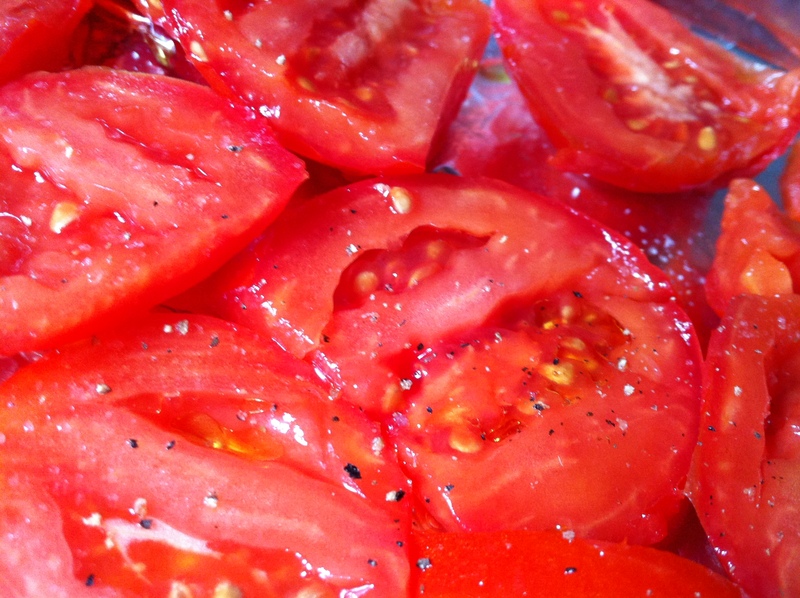 I mixed a couple varieties from my garden, including roma and beefsteak. 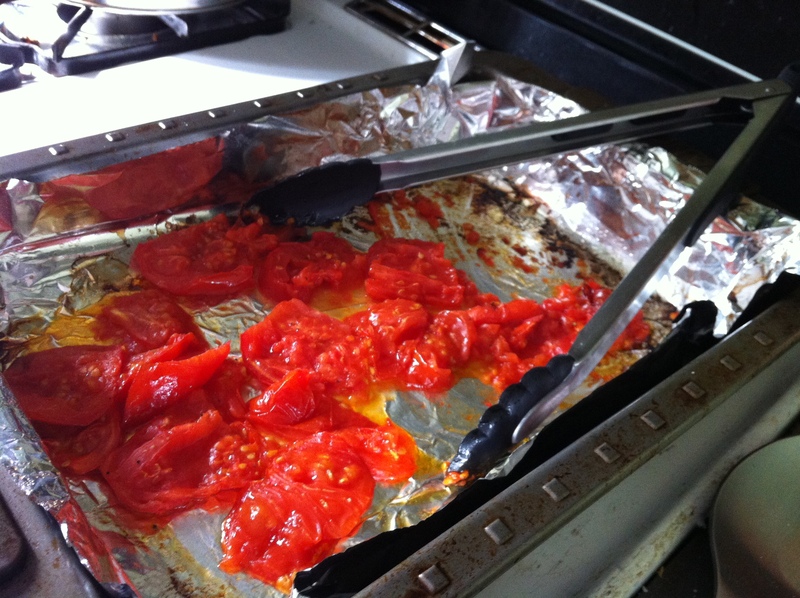 Line two baking sheets with aluminum foil and spray with non-stick cooking spray; pre-heat the oven to 375. Adding zucchini to one tray and the tomatoes to the other, drizzle each with olive oil and season with salt and pepper. Put in the zucchini first for 10 minutes, setting a timer; at 10 minutes, turn the zucchini and place the tray of tomatoes in the oven to roast as well. Cook both for 10 more minutes, or until the zucchini are really browning and the tomatoes are starting to sizzle at the edges. 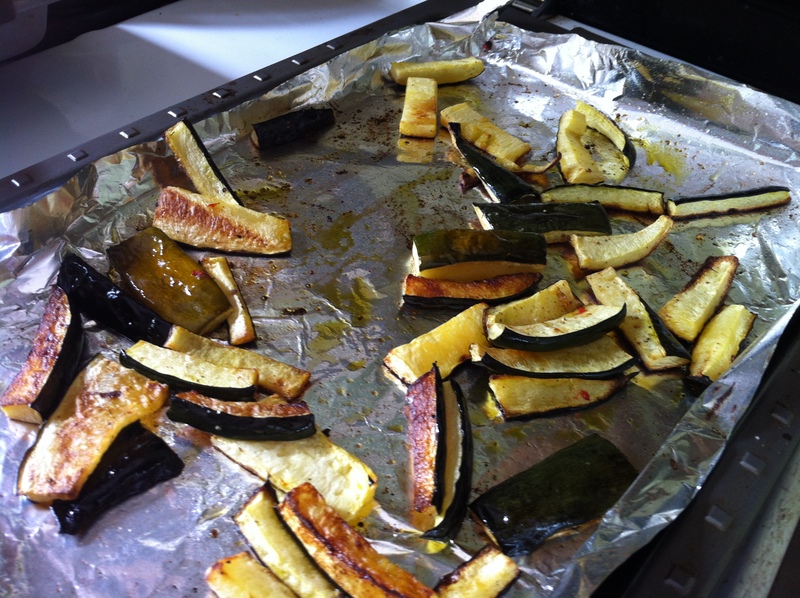 Depending on your oven and how thinly you sliced them, you may have to leave the zucchini in a tad longer. 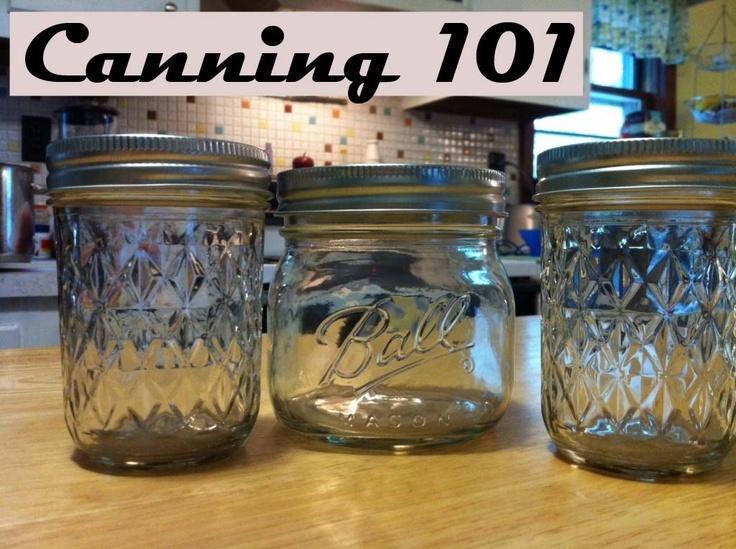 I kept my tomatoes in for 15 minutes total and my zucchini in for just over 20 minutes. Let both cool for 10 minutes. Keep the oven at 375. 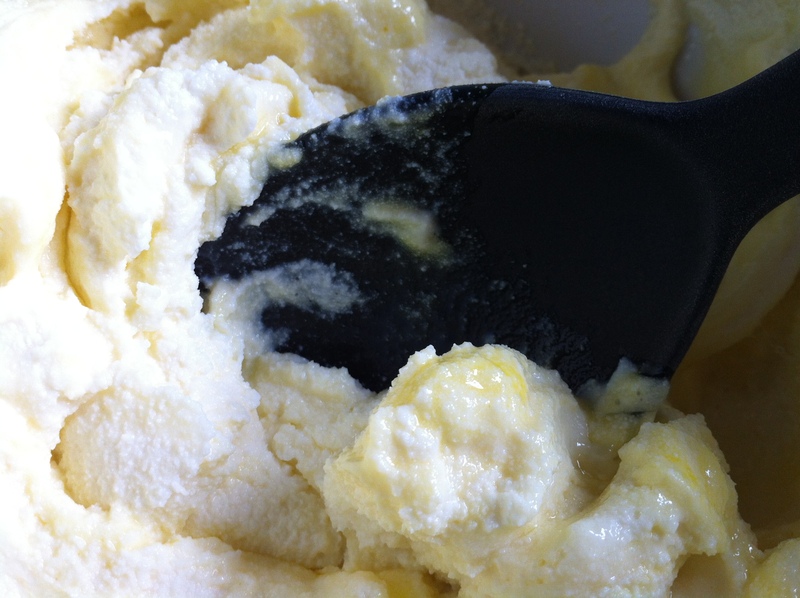 Meanwhile, mix together one egg, lightly beaten, with the ricotta and parmesan cheese, and stir by hand to blend. 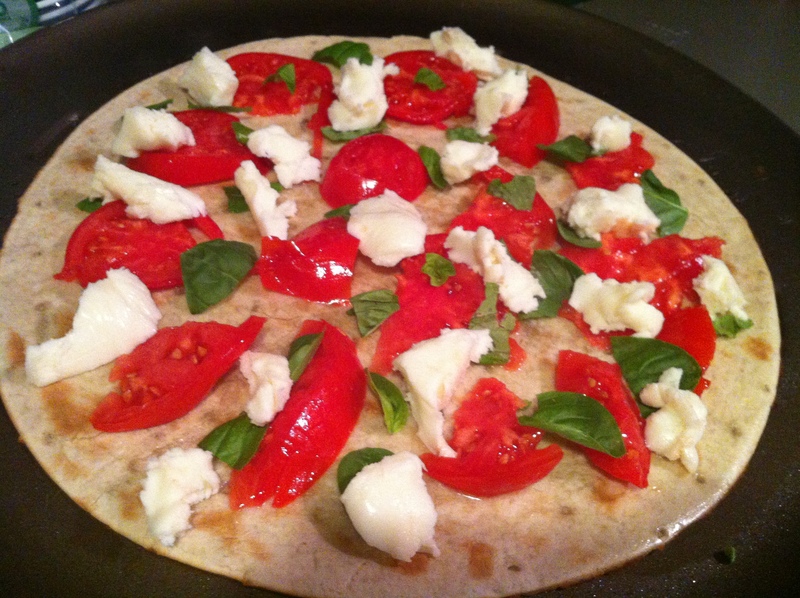 Season with pepper and torn fresh basil (half a dozen leaves). Once the veggies are cool, spray a 9-inch pie plate with non-stick cooking spray and get ready to assemble the savory pie. 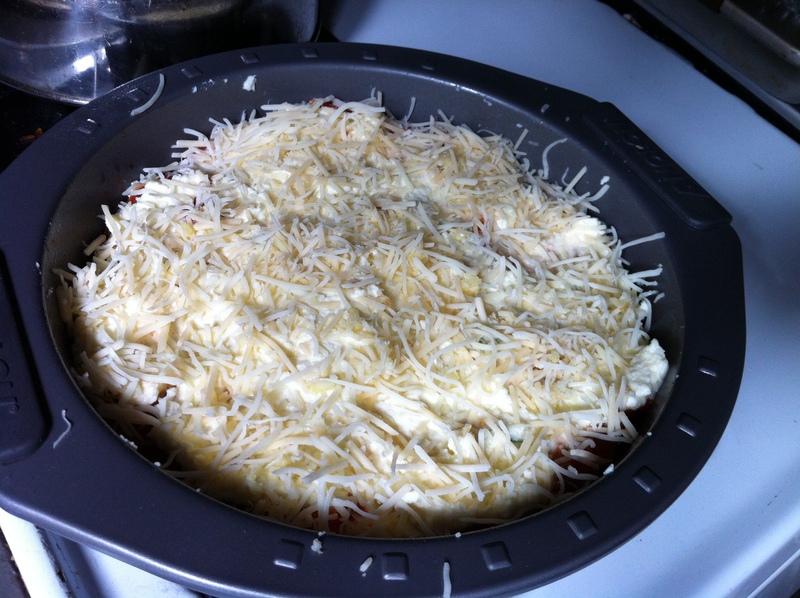 Add the zucchini in one layer on the bottom, then top with half the ricotta mixture and spread evenly. 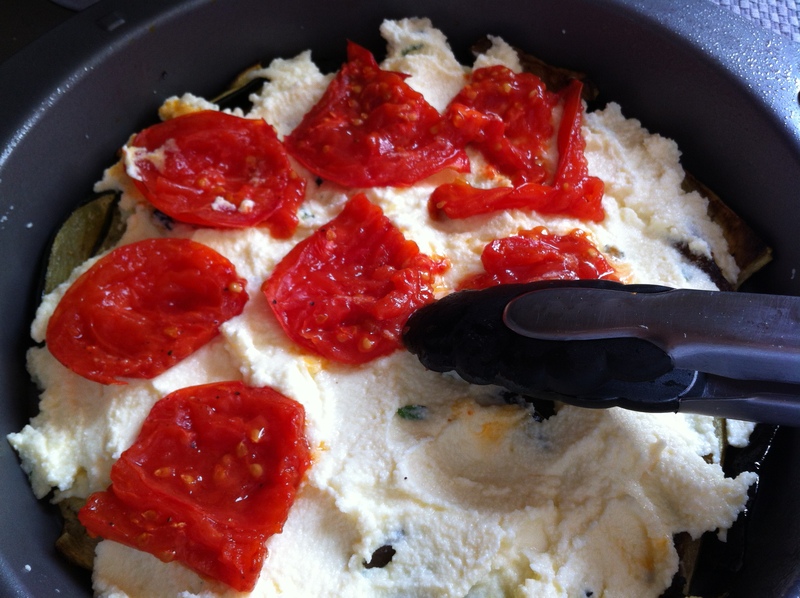 Add the tomatoes next, layering the rest of the ricotta on top and spreading out so it covers completely. 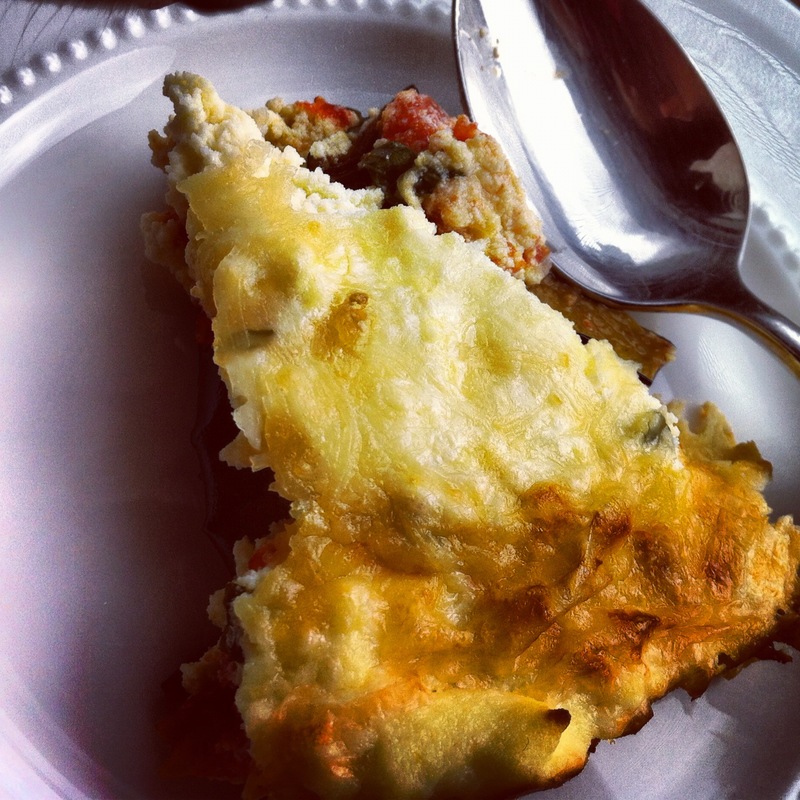 If you have a deep pie plate or you cooked an extra large quantity of zucchini and tomatoes, you can repeat these layers; just make sure you end on a ricotta layer. 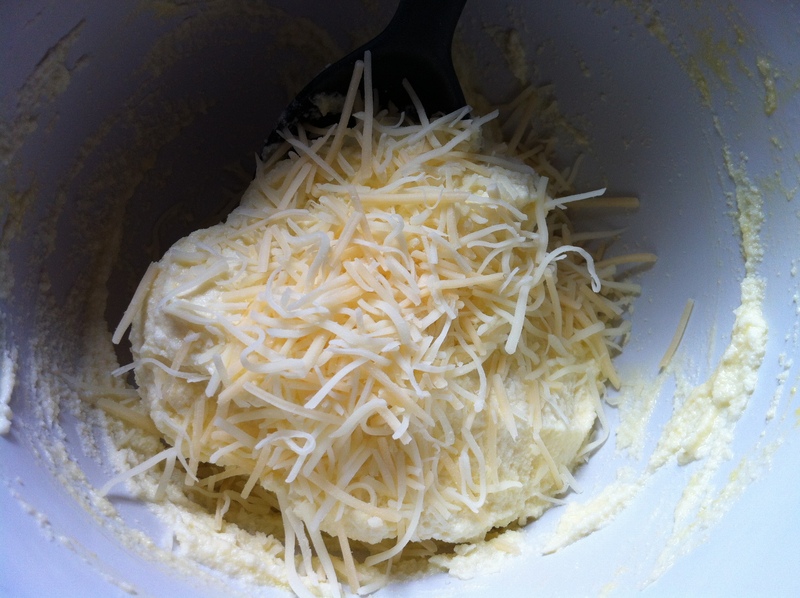 Before popping in the oven, add the rest of the parmesan cheese plus one minced garlic clove to the top of the pie. Cook for 20 minutes or until it starts browning. Let sit for at least 30 minutes before serving, so the pie sets up. Voila! 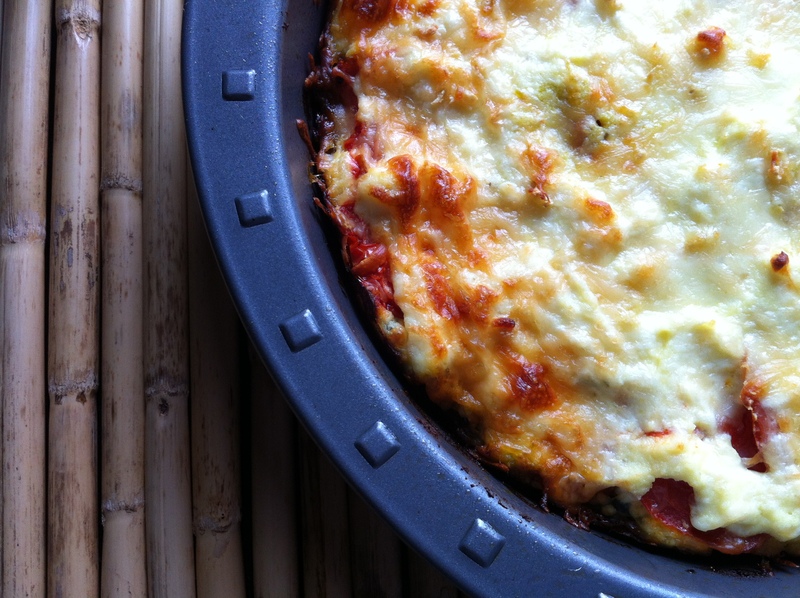 Creamy-cheesy-veggie goodness. Enjoy, friends. 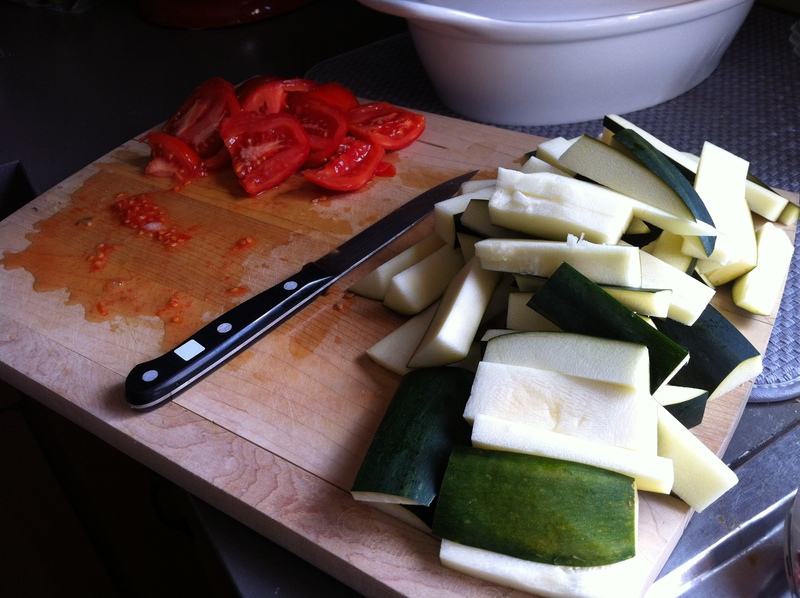 Slice the zucchini and tomatoes, discarding any stems and ends. Set aside. 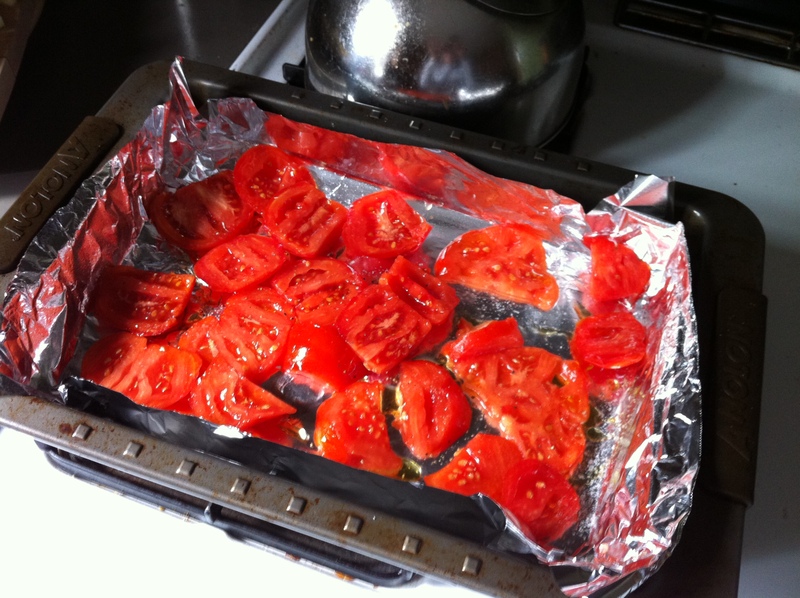 Line two baking sheets with aluminum foil and spray with non-stick cooking spray. Pre-heat the oven to 375. 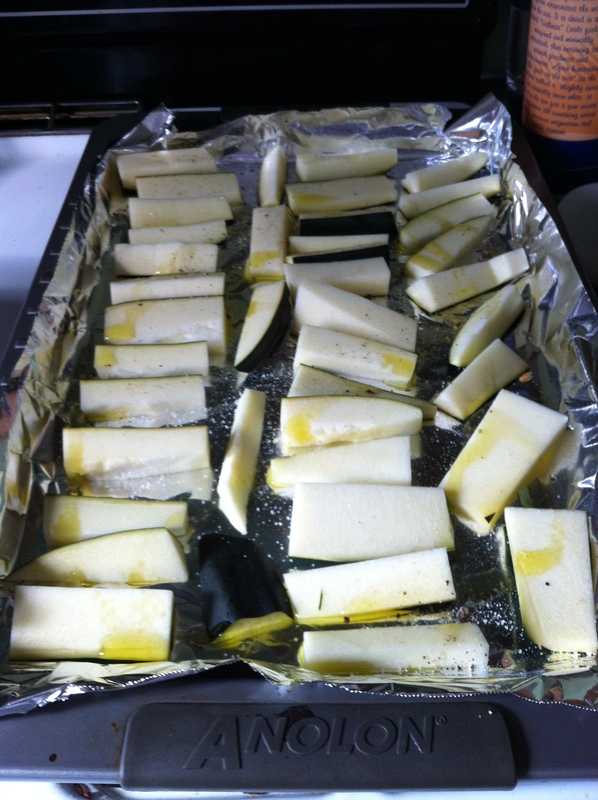 Adding zucchini to one tray and the tomatoes to the other, drizzle each with olive oil and season with salt and pepper. 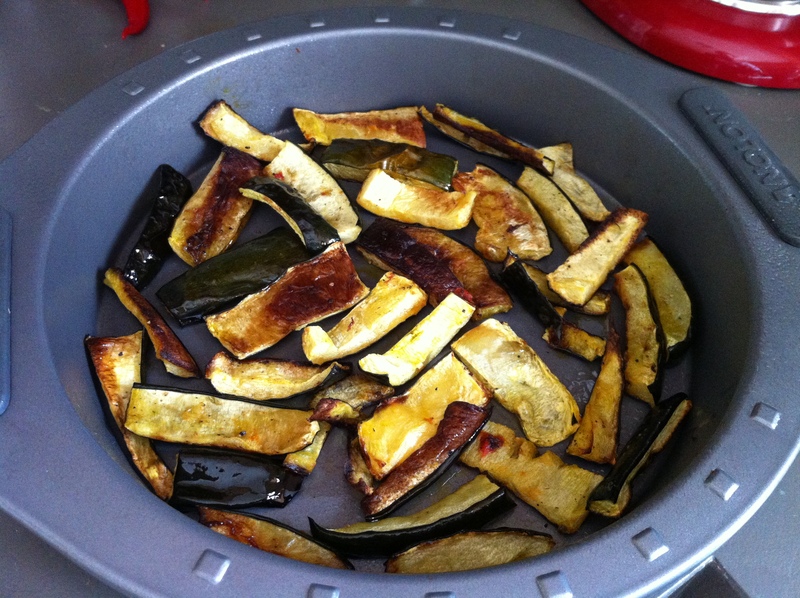 Put in the zucchini first for 10 minutes, setting a timer; at 10 minutes, turn the zucchini and place the tray of tomatoes in the oven to roast as well. Cook both for 10 more minutes, or until the zucchini are really browning and the tomatoes are starting to sizzle at the edges. 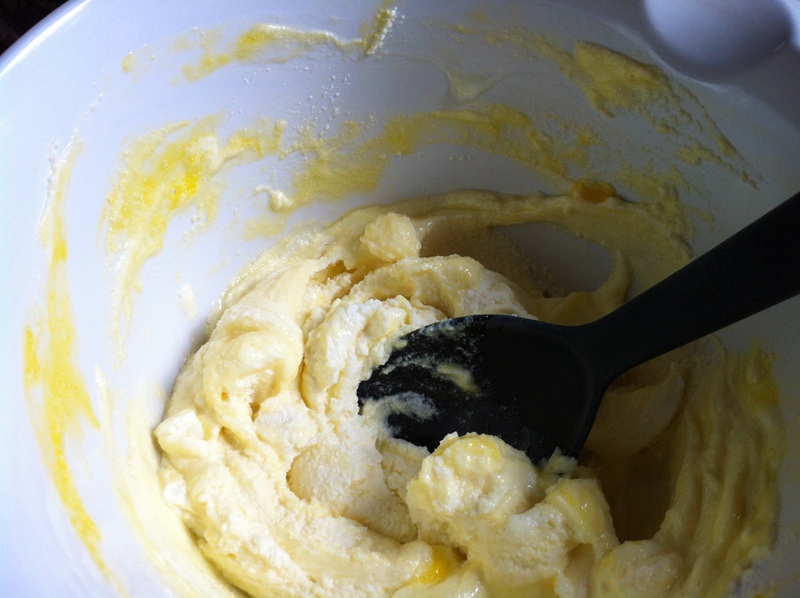 Meanwhile, mix together one large egg, lightly beaten, with the ricotta and parmesan cheese, and stir by hand to blend. 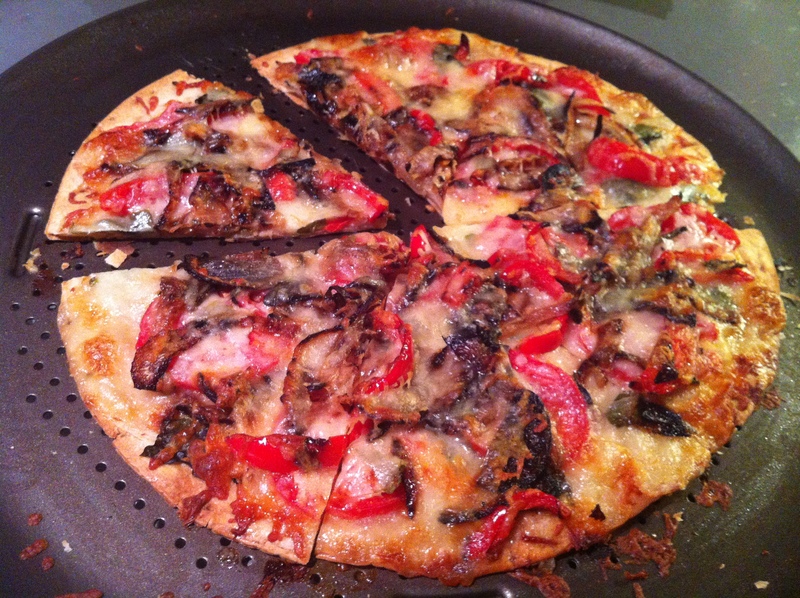 Season with pepper and torn fresh basil (half a dozen leaves). 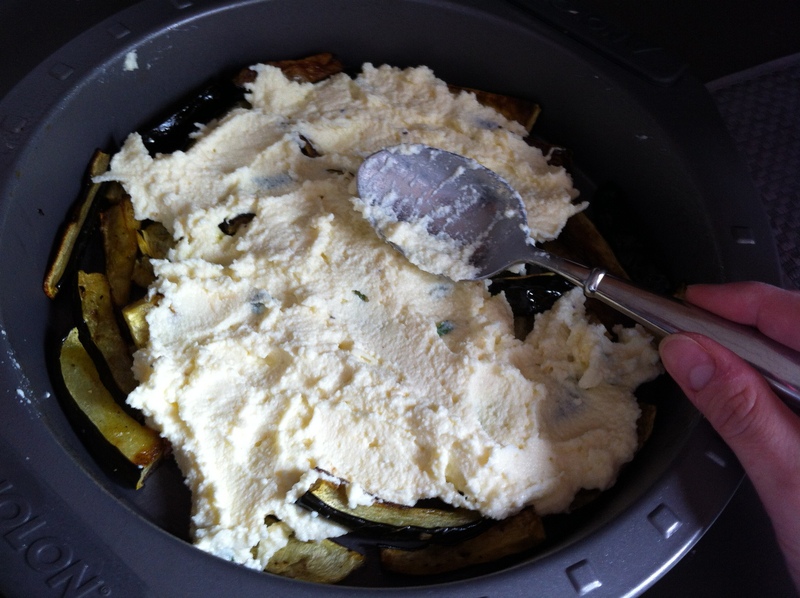 Add the zucchini in one layer on the bottom, topping with half the ricotta mixture and spreading out evenly. 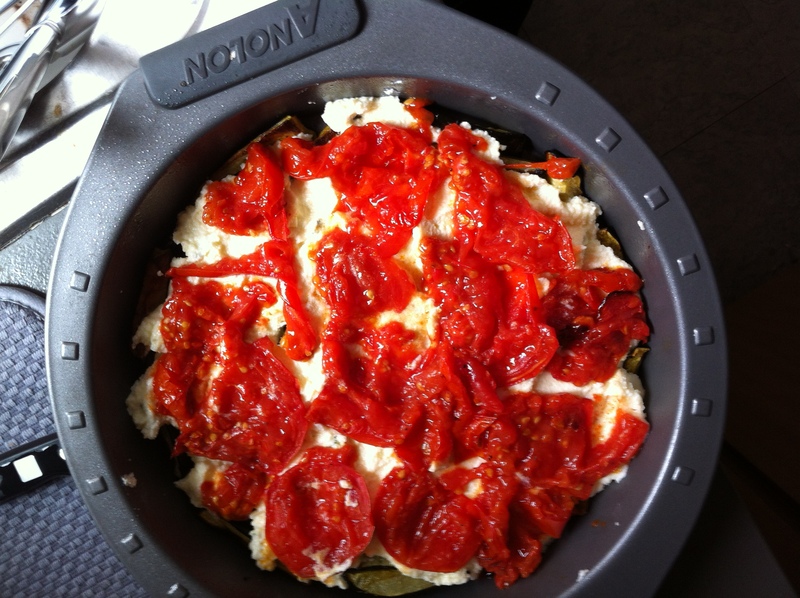 Add the tomatoes next, layering the rest of the ricotta on top and spreading out so it covers completely. If you have a deep pie plate or you cooked an extra large quantity of zucchini and tomatoes, you can repeat these layers, taking care to end on a ricotta layer. Before placing in the oven, add the rest of the parmesan cheese plus one minced garlic clove (quickly mix together in a small bowl) to the top of the pie. Cook for 20 minutes or until it starts browning. Let sit for at least 30 minutes before serving, so the pie sets up and becomes firm for you to slice. 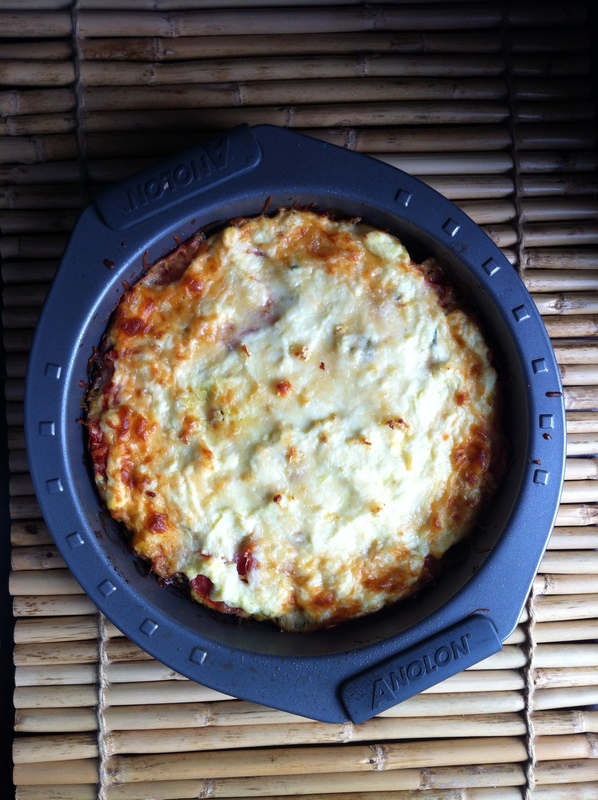 Between the zucchini, tomatoes and basil, this can really highlight the very last fruits of a summer garden before autumn begins and the frost claims the rest. 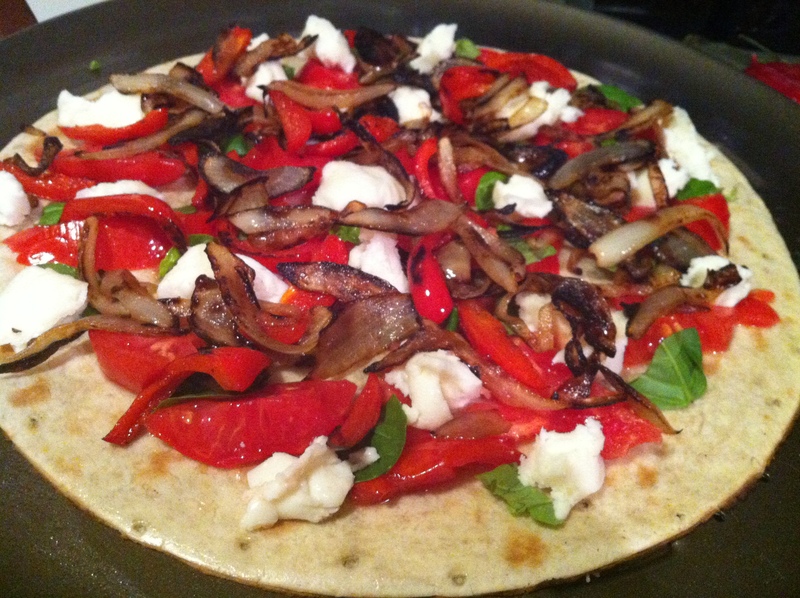 This recipe inspired by the Washington Post healthy recipe section. And speaking of great zucchini recipes, have you ever heard of making hummus with a zucchini base instead of chickpeas? 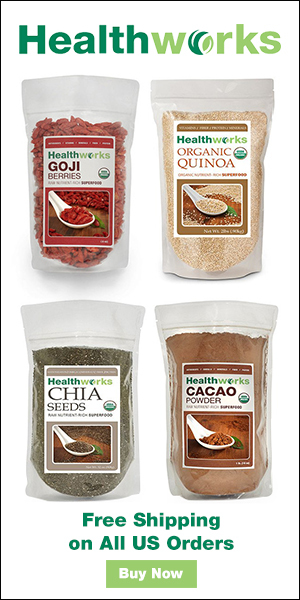 According to Kimberly Snyder, un-sprouted chickpeas can be difficult to digest because they are starchy & protein-laden. So instead of blending chickpeas into hummus, she starts with zucchini and adds tahini plus a few other organic raw ingredients to make a tasty dip. Here’s her raw hummus recipe, which makes 6-8 servings and lasts up to a week in the fridge (and yes, for those of you keeping track, I totally lied about not posting any more zucchini recipes). High quality sea salt, to taste. Process ingredients in blender until smooth. 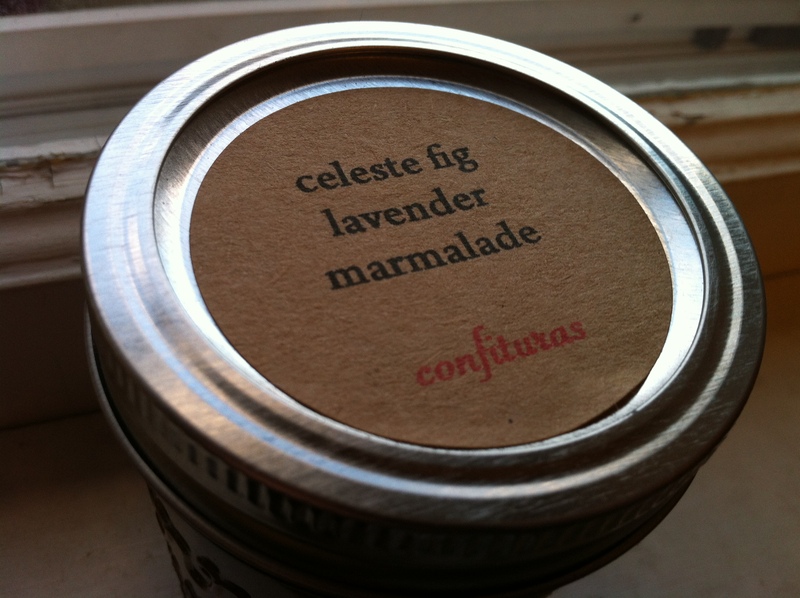 Enjoy as a dip or sandwich spread! OK. Last zucchini post of the year, I promise. This recipe is great for a couple reasons: Number one, it’s easy; and number two, it’s a new take on zucchini that’s perfect for when your tolerance is growing thin (like at the end of the summer). Simmering the diced zucchini over medium heat for half an hour lets it fall apart into an earthy, nutty paste that you’ll mix with some starchy pasta cooking water to form a simple yet satisfying sauce. 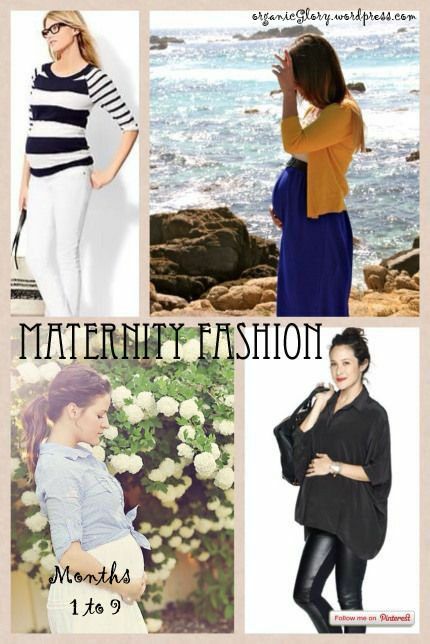 It’s great for the transitional weather between summer and fall. 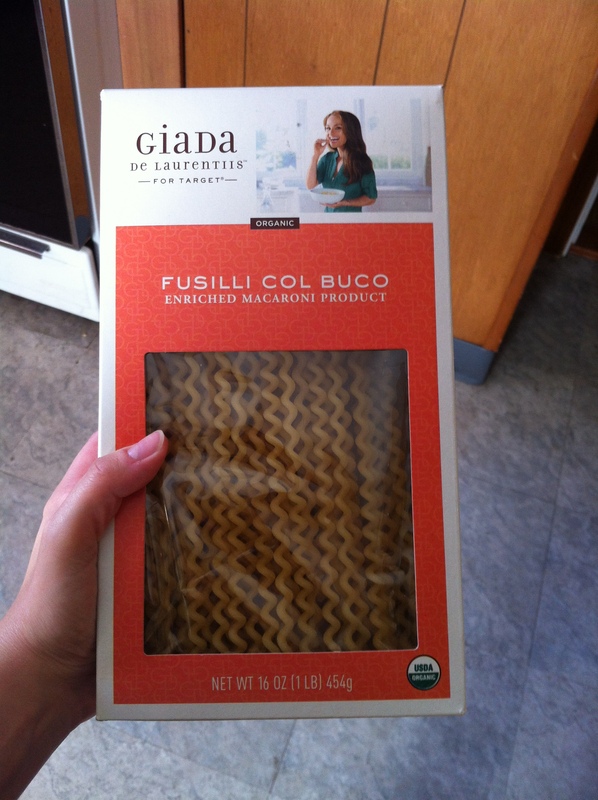 I tried Giada’s Fusilli Col Buco, which is a corkscrew shaped pasta that’s twice as long as spaghetti (doubled over in the package). “Col buco” means “with a hole,” and it refers to the way these coils look as if you could stick a straw right through the “hole” in the spirals. I really liked this product. 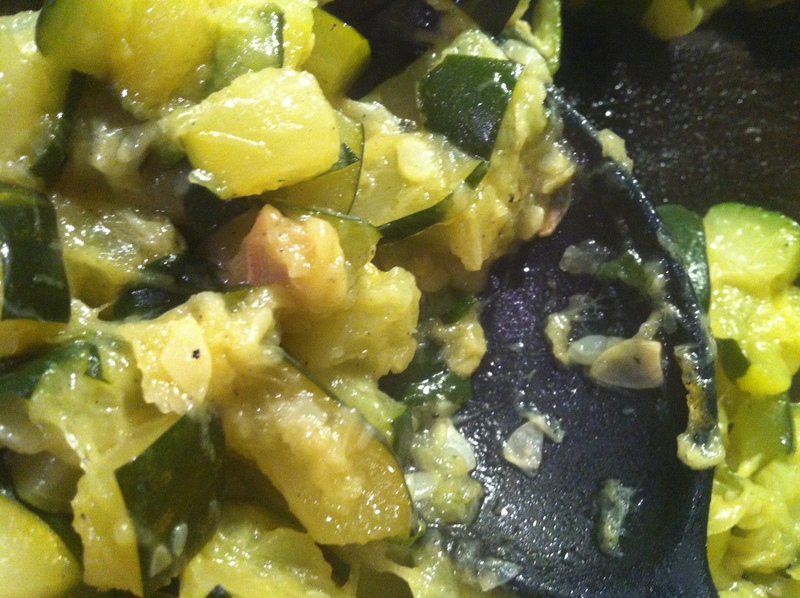 In a large saute pan over medium-high heat, toss the zucchini and olive oil and cook, stirring frequently, until it begins to brown and fall apart (20-30 minutes, depending on how small you diced the zucchini). Meanwhile, heat a large pot of water until boiling. Add the pasta and cook until al dente, or just underdone. 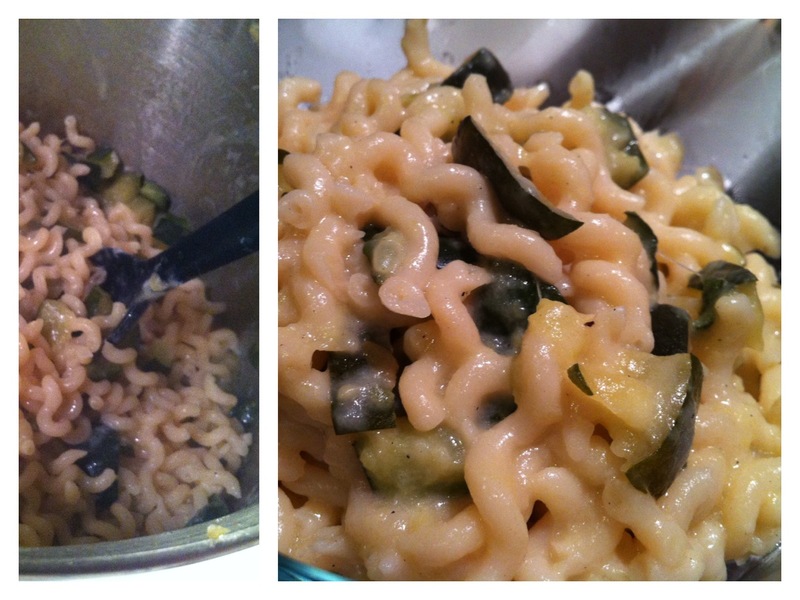 Add at least one cup of the starchy pasta water to the zucchini when it’s getting near done; let come to a boil. Stir and add more water as necessary to create a creamy sauce. 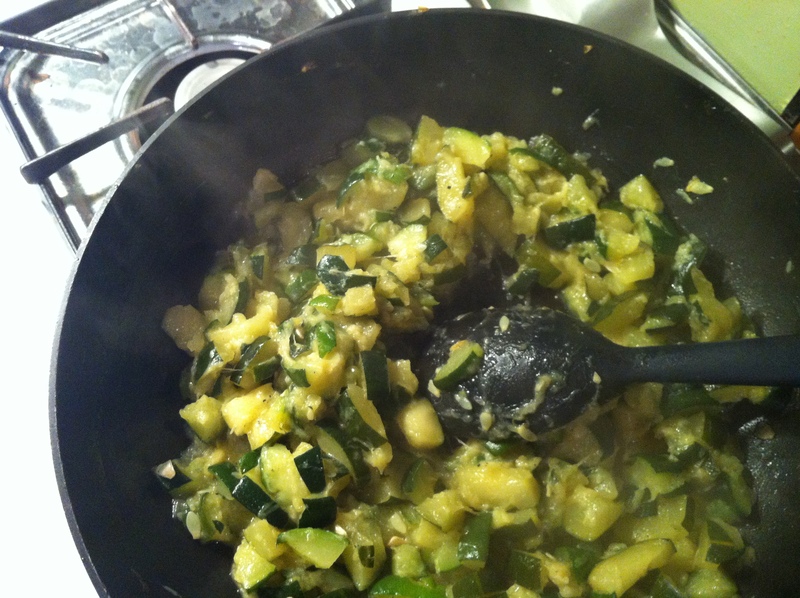 Drain the pasta and add to the zucchini mixture with a healthy dose of salt and pepper, and cook over medium-low until combined. If you’re using the cream cheese, stir in now while it’s still warm. Otherwise, top with a liberal dose of freshly shaved parmesan cheese and serve warm. 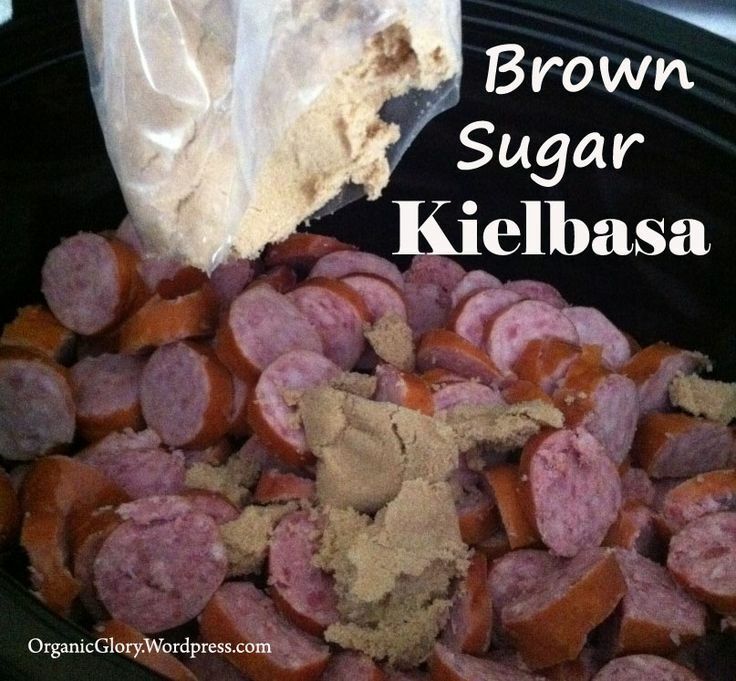 This recipe came my way from Real Life Delicious. Enjoy!